Have you ever opened a bottle of wine and instantly thought, “Why did I open this wine”? So what do you do, pour it out? BLASHPHEMY! Drink it or pour back in the bottle :). 2011 oops– 84% Cabernet Franc and 16% Carmenere blend. This is a wine that is visibly known to everyone by its label. So, let’s see what is so important that the vineyard had to print a short story on the bottle. Front label – “Lost grape of Bordeaux discovered in Chile and masquerades as a Merlot. There is a good reason the Merlot of Chile doesn’t taste like other Merlot. Many are not entirely...” I just took a sip. I don’t know why, I guess I got thirsty from writing:). VERY DIFFERENT; bold, oaky and spicy flavors. What’s that smell? Musky aromas are emerging from the glass. Since my lips can’t stay off the rim of this glass, it’s time for the tasting: swirl -rich color, sniff – absent- flat, taste – spicy, oaky with a slight metallic finish (frown). Hmm.. Try this again. Second sip– “Oops, I shouldn’t have drunk this wine (sing like Britney Spears); there are very few Cab Francs that I enjoy. This Cab Franc blend is one I do not enjoy. I peep at the half-full glass thinking, “I can’t finish this wine”. They said it correct, “lost grape masquerades as a Merlot”; it’s far from a Merlot. 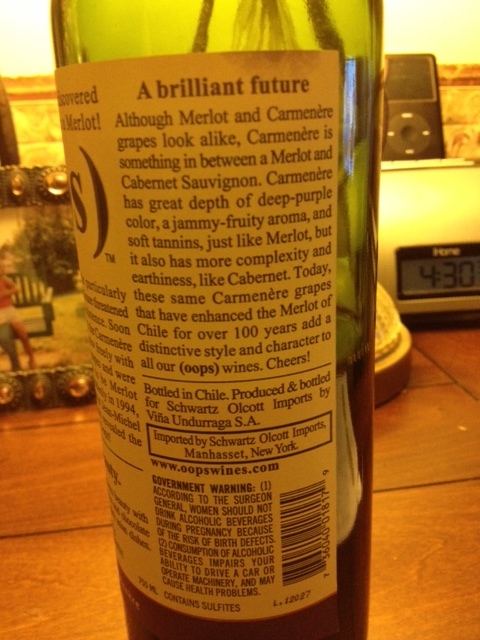 I never knew Carmenere was a Bordeaux varietal. Did you know – Carmenere originated from the Medoc region of Bordeaux, France. 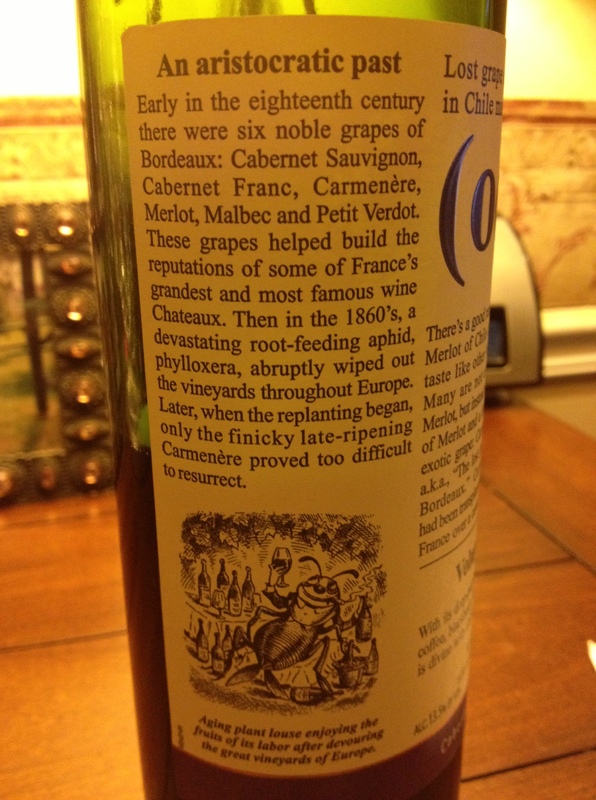 Due to a plague in 1867 that nearly destroyed all vineyards in Europe, the Carmenere vines were presumed extinct. Many vineyards found it difficult to find Carmenere vines and when located, the grapevines were hard to grow than other Bordeaux varieties. Interesting, but is all of this necessary? If we wanted to know the history of the grape, couldn’t we just go online. Since all this information is on the label does it mean the website is blank…HA, I got jokes🙂. (Exhale) I’m not writing this label- WAY TOO MUCH! Enjoy the pictures and read for yourself. Hats off to the marketing person, the wine bottle definitely stand out from others. Third sip, I can’t finish this, pouring it out. 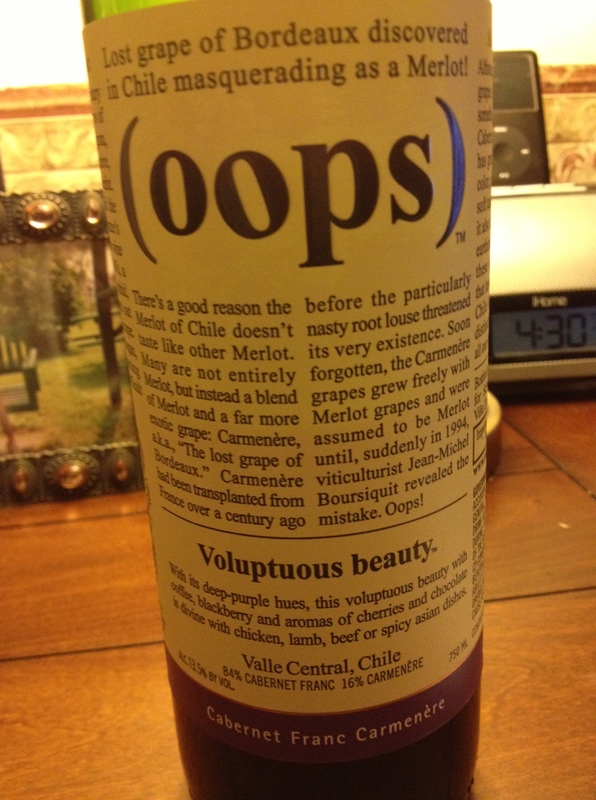 Oops is described as “Voluptuous Beauty”. I may not be able to appreciate her taste, but at least we have something in common :). You should have used it for some of your terrific mulled wine as I suggested before I brought it over – stinker!